Co-ordinates 40.8° N., 73.9° W.
New York City, officially the City of New York, is a city and metropolis in the state of New York, located on the East coast of the United States of America. New York City is known best for the New York Stock Exchange and financial district, its liberal media, its liberal Broadway shows, and its high cost of living. Shows broadcast from New York City include The Tonight Show Starring Jimmy Fallon, The Late Show with Stephen Colbert, Saturday Night Live and Fox News; New York City is also where the major networks grew in influence: ABC, CBS and NBC. With a population of 19 million in the three-state metropolitan area (and 8,140,000 in the city as in 2005), it is the most populous urban area in the United States. The city is divided into five different counties, called boroughs. Manhattan is the financial, commercial, and tourist center. Brooklyn is the most populous of the boroughs, and suburban Queens is the largest in area. The other two boroughs are The Bronx, a downscale residential area, and suburban Staten Island. The modern city was formed in 1898 through a merger of the original New York City with Brooklyn. New York City is the cultural capital of the world; it has global importance in fashion, finance, news, diplomacy, education, medicine and arts. The city is a world-class tourist destination. 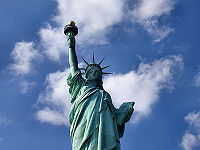 It contains many landmarks, including the Statue of Liberty, Wall Street, in Lower Manhattan, and many others. The city (along with its #2 rival Chicago) invented the skyscraper, and still has some of the tallest buildings in the world, like Empire State Building; the original World Trade Center towers were destroyed by Islamic terrorists in the September 11, 2001 attacks. New York owes its success to its status as the major hub of world transportation by air and water. It grew because it has one of the world's finest natural harbors. It is ice-free year-round and deep enough to enable large ships to reach its piers regardless of the tide. The Port Authority of New York and New Jersey was established in 1921 by the two states in order to administer jointly the shared waterfront. Most traffic is now handled through containers. Three major airports serve the city: John F. Kennedy International Airport (for international travel) and La Guardia Airport (for domestic travel), as well as nearby Newark International Airport. All three airports are operated by the Port Authority, which also operates certain bridges, tunnels and subway lines that connect New York and New Jersey. When Hurricane Irene was headed for the city in August 2011 following a harsh winter, the MTA (Metropolitan Transportation Authority) shut down all its commuter rail, subway and buses. This move was criticized by some as excessively cautious. The first Dutch settlers arrived on Manhattan in 1624, naming the town New Amsterdam. Indian claims were bought out for the equivalent of $24. The Dutch sent settlers up the Hudson River (which is easily navigable by sailing vessels) to Albany. The Dutch colony, named New Amsterdam, was run in autocratic fashion by Governor Peter Stuyvesant. It soon had a cosmopolitan flavor, with freedom of religion and numerous ethnic and religious groups; the Dutch brought slaves as house servants. The city was captured in war by the British in 1664; they renamed both the city and the colony for the Duke of York (who later became King James II). The use of Ellis Island as the checkpoint for millions of European immigrants in the late 19th Century caused New York City's population to swell, as many settled in the city. New York City is historically considered a liberal city, with the majority of the population voting Democrat. However, the mayor has recently been Republican, in the case of Rudy Giuliani or independent in the case of the liberal Michael Bloomberg. In November 2013, liberal Democrat Bill de Blasio was elected mayor and despite his anti-law enforcement rhetoric and liberal socialistic policies, was re-elected in November 2017. Fox News Channel is based there in Manhattan. Of the 13 congressional districts that include parts of New York City, only one is represented by a Republican (Daniel M. Donovan, Jr. of Staten Island). New York City is home to top-notch museums in art, architecture, photography, natural history, television, radio and technology, like: The Metropolitan Museum of Art, Solomon R. Guggenheim Museum, The Frick Collection, the National Design Museum, the Museum of Natural History, and the National Academy Museum and School of Fine Arts. Each borough elects its own borough President and district attorney. Unlike the London boroughs, the boroughs of New York City do not operate as local governments. All of the non-Manhattan boroughs are sometimes referred to collectively as "the outer boroughs" as they are arranged in a sort of semicircle around Manhattan. Each borough has its own court system, and two boroughs have separate public library systems. Museum of American Financial History. A Walking Tour of Rockefeller Center's Public Art. Prometheus Fountain at the Rockefeller Center. Information Please - Top 50 Cities in the U.S.
↑ (1922) World Almanac and Book of Facts for 1923, series: World Almanac and Book of Facts (in English). New York: Press Pub Co. (The New York World), 63. Rounded down toward zero. ↑ Slavery was finally abolished in 1799. This page was last modified on 9 April 2019, at 13:15. This page has been accessed 45,042 times.